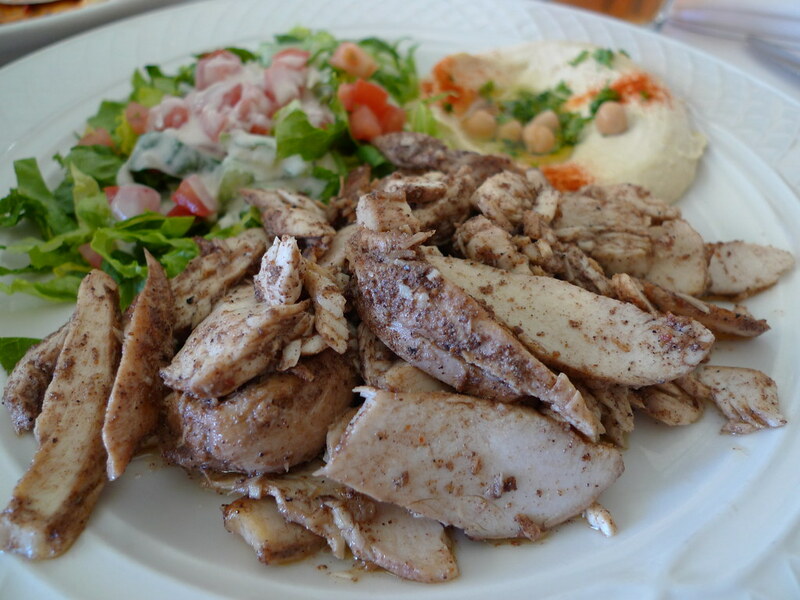 Shawarma is prepared from thin cuts of seasoned marinated lamb, mutton, beef, chicken, or turkey. The slices are stacked on a skewer about 2 feet (60 cm) high. Lamb fat may be added to provide extra fat for juiciness and flavor. A motorized spit slowly turns the stack of meat in front of a heating element, continuously roasting the outer layer. Shavings are cut off the rotating stack for serving, customarily with a long, sharp knife. Shawarma may be served on a plate, but is most commonly prepared as a wrap inside of a flatbread such as laffa or pita. It is often served with diced tomatoes, cucumbers, and onions, pickled vegetables, and tahini sauce or amba mango sauce.